So, you've bought your telescope, and....now what? You might have taken it out for a few observing sessions, and found that getting going with your new toy was a bit more difficult than you had expected. Like so many other fields of endeavor, observing is much easier when you have the right set of tools. Here, we will cover the essentials that every observer should have in their toolkit, plus a few tools that are specific to the type of telescope you might own. Observing is done in the dark. You need some sort of light so you can see eyepieces, your telescope controls, and whatever observing notes you might be using. Unfortunately, a standard flashlight emits a bright white light â€” which is great for lighting up your surroundings, but also good at blinding you and ruining your dark adaptation. It's very bad form to use a white flashlight at a star party for this reason. Pictured here are two red flashlights. Telescope stores offer them, or you can make your own. The one on the left is a commercial red LED flashlight. It has a dial to adjust brightness â€” this is very important. While observing, you want to use just enough light to see your eyepiece, chart or whatever, but no more. At the end of the night, when you pack up, or if you're walking around between telescopes at a star party, you can dial up more light to find your way around. 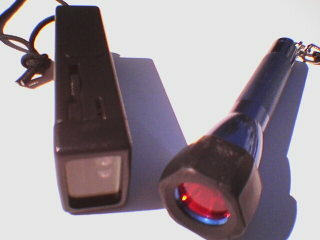 The light on the right is a regular Mag-Lite flashlight, with a red plastic filter on the lens. Mag-Lite actually sells a little kit that includes a red plastic filter. But I prefer the LED flashlights because they are brighter, and don't run down the batteries as quickly as a Mag-Lite. Plus, the Mag-Lite seems to burn out its light bulb rather often. If you get a red LED flashlight, don't get a model with a white light built in â€” you don't need it. If it's there, you're likely to change it to white beam by accident â€” usually in the middle of a star party when you will blind yourself and everyone else nearby. Instead, get a separate white flashlight that you can use when the circumstances are appropriate (usually when you and everyone else are packing up from a long night's observing!). Finally, it's helpful if the flashlight has a strap so you can put it around your neck. That makes it easy to find the flashlight in the dark. A "red dot", or Telrad finder, is the best help you will get for finding objects in the sky. Even if you have a GOTO scope such as the Meade ETX or Celestron Nexstar, you will want one of these because it makes aligning the telescope to its guide stars so much easier. These finders (also called "unit power" or "reflex finders") simply project a red ring or dot on the sky when you look through them. Basically, they act as a "gunsight" to allow you to accurately aim your scope. Wherever the bullseye is pointing, your telescope is too. The Orion red dot finder is the sleeker, rounder item pictured here; several other manufacturers make similar models. I think the best one is made by StellarVue. 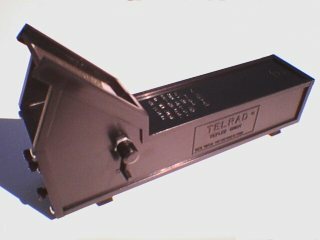 The Telrad (the bigger, boxier item) is the original finder from which all others descended. It is kind of bulky next to some of the newer models, but it is quite light and has virtues of its own. For example, it projects nice bullseye rings rather than a single dot, and it suffers less from parallax issues when you move your eye around while looking through it. A Planisphere is a compact, rotating star map. You dial up the current date and time, and it shows you a map of which constellations and bright stars are up. This is a great way to learn the constellations, and it's essential if you have a GOTO scope. The telescope will expect you to center it on specific stars in order to calibrate and align its GOTO feature â€” and it's very helpful to know where in the sky the alignment stars are. 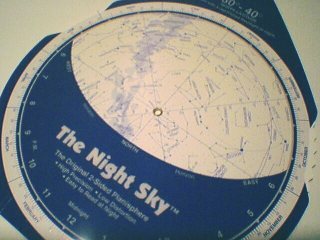 The very best planisphere is called The Night Sky by David Chandler (pictured here). This one is unique in that it shows you a northern horizon-facing view on the front, and a southern-facing view on the back. This reduces the distortion that planispheres inevitably exhibit, making it easier to trace constellations in the sky. You can purchase it online from Sky and Telescope. Make sure to get the model that's specific for the latitude where you live. The planisphere is useful for getting your bearings, but eventually you will need a more detailed star map to show you where all the interesting things are. Then you should shop for a basic star atlas. A basic star atlas shows stars down to around 6th magnitude (limit of naked-eye visibility) or deeper to perhaps 8th magnitude. An atlas like this will show you what you need without overwhelming you with detail. Even when you become an experienced observer, you will still find a bright star atlas like this one very useful on a regular basis. For a list of recommended atlases, see the article Astronomy Books for the Beginner. To accompany your atlas, it's good to have a book that explains the basics of observing - how to find objects in the sky, along with suggestions for observing projects to get you going. The beginner's guides generally start you with things that are easy to see â€” which is good because they are also among the prettiest! For a list of recommendations, again I refer you to the article Astronomy Books for the Beginner. 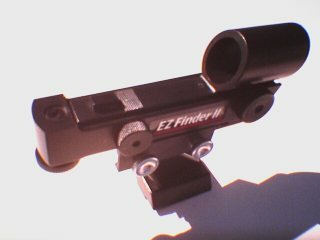 If your telescope has an equatorial mount, or if you have a GOTO telescope, this is a handy item to have. It makes it easy to level your scope. For GOTO scopes, this is essential. A GOTO scope wants you to level the tube and point it towards north before it starts locating its alignment stars. The more level and the better pointed you are towards north, the better it will guess as to where the alignment stars are. This translates into easier setup of your scope. 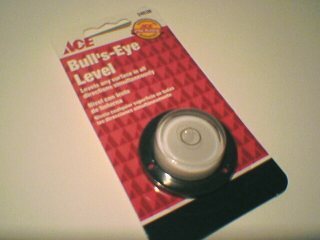 You can find these in any hardware store, for about $3. If you have a Newtonian reflector telescope (and this includes Dobsonians), you need to collimate (align) the optics, usually every observing session. Collimation is very important, and will dramatically improve the quality of the images you see through your telescope. 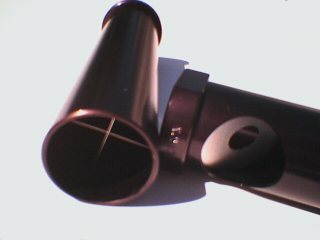 Pictured here are a sight tube (left), and a Cheshire eyepiece (right). These go into the focuser, in place of a normal eyepiece. The sight tube is used for aligning the secondary (diagonal) mirror. Once the secondary is aligned, you use the Cheshire to align the primary mirror. You can buy "combo" units that combine both features into one special eyepiece, but separate tools are preferred. The separate tools are less confusing, and more accurate. You can spend lots of money on fancy collimation tools, such as laser collimators and the like. I own a laser collimator myself. But these two tools are all you really need for collimation. The best collimation tools are made by Tectron Telescopes. Here is a very comprehensive FAQ for collimating your Newtonian Telescope. Get your hands on some of these items, and see what a difference they make in the quality of your observing sessions. Armed with these tools, you should be set to take on the entire Universe!